I had a dream last night that BYU beat Texas 9 to 7 on a last-minute field goal. If that actually happens, I am naming myself the official BYU sports psychic. Unfortunately, I don't think that's very realistic. I'm pretty sure BYU is going to lose . . . but all I really care about at this point is that they put up a good fight and don't get creamed. That's one dirty jersey . 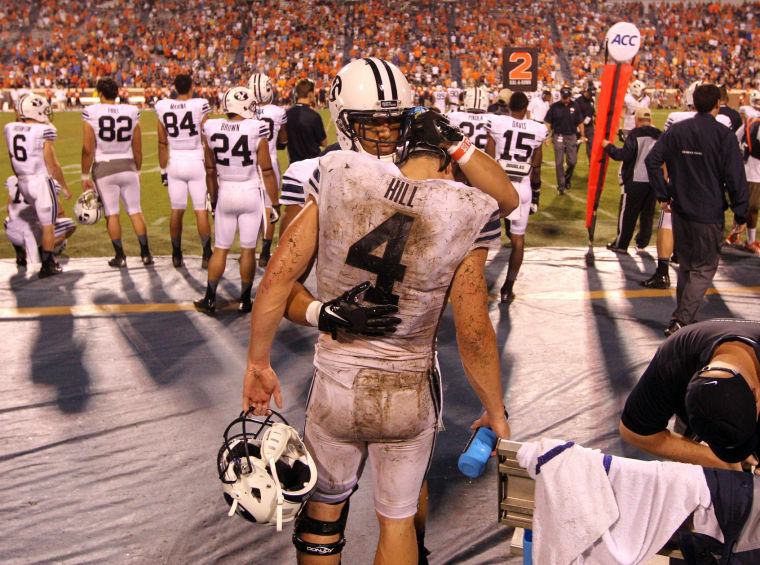 . . and one sad Taysom Hill. I've heard a lot of people whining about how terrible Taysom Hill was at quarterback in the Virginia game . . . honestly, that thought never even crossed my mind during the . . . what was it? 9-hour long game . . . or at least it sure seemed like it! I think Taysom is gonna be just fine. He just needs to get rid of the jitters and find a rhythm. The situation was far from ideal in Virginia-- the ball was wet, he didn't have Cody to throw to, and I think it was the longest game EVER. All I know is Taysom walked off that field at the end of the game with a previously-white jersey that was practically black, caked with dirt, mud, and grass. He worked his tail off in that game and, even though the Cougs came up short, I don't think he is to blame at all. So who is to blame? A combination of a lot of things. Partly the weather, partly the 2-hour rain delay, partly Cody's hamstring, and partly the offensive line. Alright, it was in large part the offensive line, IMHO. They have GOT to get their heads on straight or it's gonna be a really long season . . . Robert Anae announced pretty quickly after the Virginia game that they are already going to shake up the starting O-line for the Texas game this afternoon. Not sure if that's a good sign or not-- I just really hope they find something that works. I went to the BYU Football Stadium Party on Wednesday evening and someone asked Bronco if Cody was going to be able to play on Saturday (today). His response was: "They're telling me 'possibly.' What does that mean? I'm not sure. I assume it's somewhere between probably not and likely." Ah, typical Bronco. I really hope the Hoff can get out on the field today, but of course, I'd rather have him sit it out than get injured even worse. What's gonna happen tonight? Unless my dream really does come true, I have absolutely no idea. Kick off in t-minus 6 hours . . . let's go, Cougars!